COLOMBO (Reuters) – Police on Tuesday clashed with protesters led by a Sri Lanka cabinet minister who vowed to besiege the U.N. office until Secretary-General Ban Ki-moon dissolves a panel advising him on possible war crimes. Sri Lanka’s government is furious at Ban’s appointment of the three-member panel on June 22, saying it is a violation of its sovereignty and a hypocritical application of double standards by Western governments engaged in the war on terror. The panel is to advise Ban if any crimes were committed in the final months of Sri Lanka’s quarter-century conflict with the Tamil Tiger separatists, in which government forces won total victory in May 2009. Engineering Services and Construction Minister Wimal Weerawansa, a firebrand nationalist ally of President Mahinda Rajapaksa, led several hundred people to the entrance of U.N. headquarters in the capital Colombo. 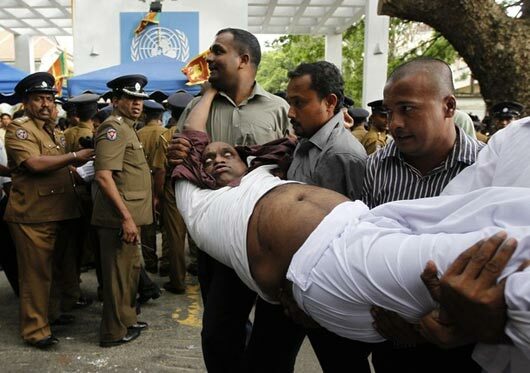 “We will hold a fast unto death until the withdrawal of Moon’s panel,” Weerawansa told the crowd of demonstrators, who had vowed to stop U.N. staff from leaving the premises. Later, police set up a cordon to allow U.N. staff to leave, and then began skirmishing with protesters. A former legislator allied to Weerawansa was struck and sent to hospital, as was a senior police inspector and at least six others. After police intervened, Weerawansa made a call on his mobile phone, a Reuters reporter said. The call was to Defense Secretary Gotabaya Rajapaksa, the president’s brother who also oversees the police, Weerawansa spokesman Mohammed Mussamil said. Weerawansa passed the phone to the commanding officer who answered: “The inspector general of police ordered me to do this, sir.” Moments later, he ordered his men back and the demonstrators erupted in cheers. The United Nations said it respected the right of citizens to demonstrate peacefully but considered any hindrance to its staff’s movement as a serious concern, spokesman Farhan Haq told reporters at a briefing in New York. “The government has provided assurances for the safety and security of our staff and for their full access to their offices. We will be closely monitoring developments and trust that these commitments will be honored,” Haq said. Sri Lanka views Ban’s panel as an unnecessary affront to its sovereignty, given it has its own commission investigating rights violations. However, Sri Lanka has a four-decade history of commissions tasked with probing abuses that have produced little. Sri Lanka is under pressure from the West, after rights watchdogs took advantage of the anniversary of the war’s end to renew a push for an international probe into what they say are tens of thousands of civilian deaths. The government denies soldiers committed any crimes, and says the casualty numbers are hugely inflated by Tiger supporters who live in the West as refugees and fear they will lose that status now that the war is over. It is also furious that its fight against a group on U.S. and EU terrorism lists for suicide bombings and the use of child soldiers is under scrutiny while none is given to the thousands killed by U.S. forces in Iraq, Afghanistan and Pakistan. Sri Lanka on Tuesday dismissed the European Union’s withdrawal of a trade preference, worth about 100 million euros ($125.4 million) annually, after it refused to make written pledges to improve its human rights record. I urge Wimal Weeravansa to hold only a peaceful protest and not a rabble-rousing violent protest. The protest and defiance should be against Ban Ki-Moon alone and call for his immediate resignation or sacking by the UN General Assembly for his partisan politics of turning a blind eye to US, British and Israel war crimes and crimes against humanity of torture and killing of detainees and innocent civilians in Iraq, Afghanistan and Gaza. 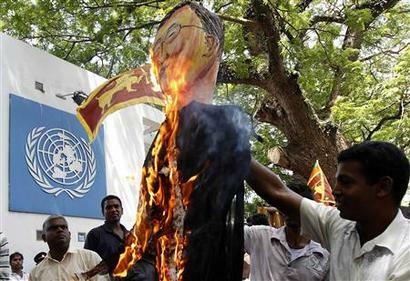 The staff of UN office in Colombo should have free access to the office and certainly not be subjected to any form of humiliation and violence by the protestors. Do not turn this peaceful protest into a violent rally in JVP style. Our enemy is Ban Ki-Moon alone, the puppet of imperial West. He is corrupt in being partisan to imperial West and Tamil LTTE diaspora. He no longer has the confidence of the larger membership of the UN, the Freeworld. Hence he should go.